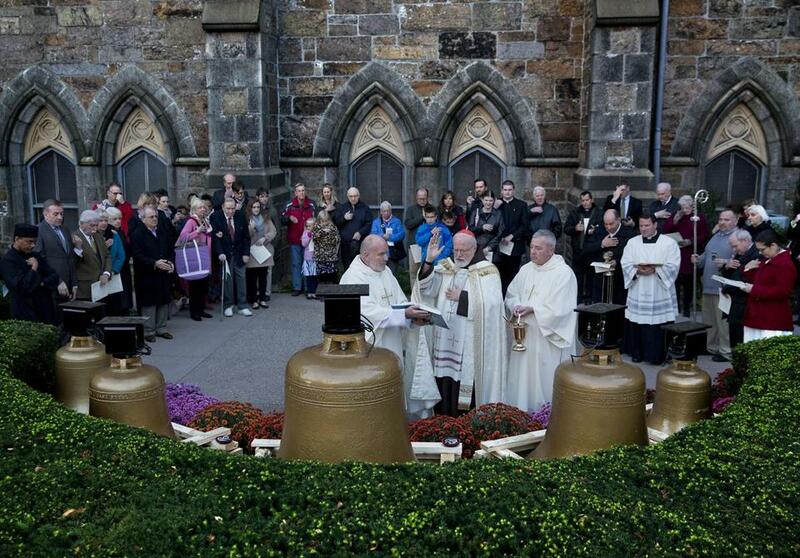 Cardinal Sean O’Malley (center) blessed the bells of the former Holy Trinity German Catholic Church outside the Cathedral of the Holy Cross, where they will be hung soon. After years of playing bell sounds from a speaker system in its tower, the Cathedral of the Holy Cross in the South End will finally have the real thing. As part of a larger renovation, the principal church of Boston’s Catholic archdiocese will install five steel bells that for more than a century rang out from the nearby tower of the now-shuttered Holy Trinity German Catholic Church. During a blessing of the bells Sunday evening, Cardinal Sean O’Malley talked of growing up hearing the sound of church bells ringing every morning, every evening, and 33 times on Good Friday. They tolled mournfully for funerals and pealed joyfully for weddings. The cathedral’s belfry has been braced with steel to support the 2-ton weight of the bells, and they will be hoisted into place this Friday. The installation is part of a much larger renovation project. Earlier this year, workers began to clean and repair the church’s masonry, which had been stained by soot from decades of car and train traffic that rumbled down Washington Street before the Orange Line was relocated. The renovations are being funded by $2 million in private donations. “Now it’s got the bells to match,” said Bill Mosakowski, one of about three dozen people who shivered in the side yard of the cathedral while O’Malley shook incense and sprinkled holy water on the bells to bless them. Before coming to Boston, the bells were installed at an unknown church in New Orleans, according to Timothy McGuirk, a spokesman for the cathedral. General Benjamin Butler, a former Massachusetts governor who became the military commander of New Orleans when union troops captured the city during the Civil War, confiscated the bells of a parish church in an “unfriendly” part of the city and had them shipped here and sold, McGuirk said. Father Ernest Reiter purchased the bells for $1,500 in 1863 and had them installed in the tower of the Holy Trinity German Catholic Church on Shawmut Avenue, which was completed in 1877, according to the archdiocese. McGuirk said details about the bells’ history came from a booklet created to mark the centennial of the Holy Trinity parish in 1944. The Holy Trinity church was closed in 2008, and the building is being radically redesigned and turned into condos. The bells were restored earlier this year by The Verdin Co. of Cincinnati, which is also helping install them in their new home. O’Malley said he named each of the bells after a saint: Boniface, a German saint, to honor the German parish they came from; Therese, the patron saint of missionaries; Helena, who preserved the cross that Catholics believe Jesus was crucified upon; Gabriel, the angel believed to be God’s messenger; and Joseph, husband of Mary, Jesus’ mother. Jean Kelley, a parishioner at the Cathedral for 29 years, said she was happy the bells were about to be hung. But aware of their long history, she corrected a reporter who asked her what she thought of the new bells. “They’re not so new,” she said.